In 2017, we had the fourth edition of the Regional Scrum Gathering Rio de Janeiro, Brazil. It was the largest one so far, with 500 attendees and 165 people on the waiting list. 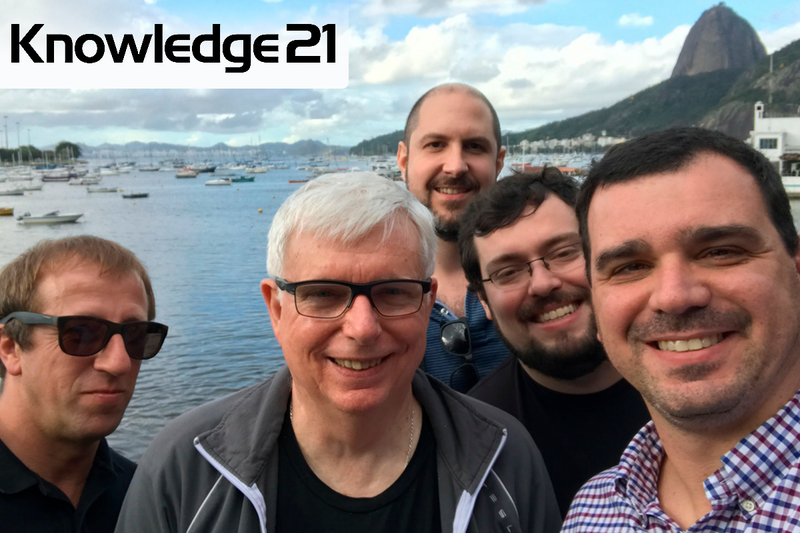 Jeff Sutherland, the creator of Scrum, was there as our guest and Keynote speaker, along with Ademar Aguiar, one of the brightest Agilists out there. Among the countless things we talked about, one discussion was particularly interesting: the Daily Scrum. As it was Jeff’s first time in Brazil, we spent the whole week together doing sightseeing and, of course, talking about Scrum. We all learned a lot from him while drinking local beers. Managers and why not, Project Managers, still feel the need for a little bit (sometimes a lot) of command and control. That is probably the reason why in many organizations the Daily Scrum is actually used as a status report meeting. Instead of a self-organized, Dev Team only event, the event is stolen from developers and turned into a moment to check how well the Team is doing, so the Manager can simply update his/her Gantt chart or whatever tool they use to control the environment. As Jeff says, it’s not possible to do twice the work in half of the time if we’re not doing things right in the first place. The Daily Scrum is not a status report. Period. Just to make it clear: if you bump into a problem you can’t fix by yourself, you should ask for help right away. Don’t wait until the next Daily Scrum to do something about it, ok? Oh we’ve all seen it, right? The Dev Team waiting for the Daily Scrum to move all those completed tasks on their taskboard. But wait a minute: what’s the point of having a beautifully designed taskboard, in a location we all can see if it will be outdated for twenty-three hours and forty-five minutes every single day? If something is done, move it to “done” right away and grab the next task to stick on doing. Don’t wait until the next day! It makes no sense at all. Just follow this simple rule: your taskboard must be up-to-date all the time. And it’s your responsibility as a Team member to make it happen. Daily Scrums are incredibly effective if you’re doing it right. It’s simple and pretty straightforward, but you should ask yourself: Do I know why I’m doing this? Thinking like this may take you to the next level. Hope you enjoyed this article and please leave your comment and feedback. « How detailed should the backlog be?